A near-super-human effort allowed Ilkley Town to host the only surviving West Yorkshire League game of the weekend. While the weather caught up with all three divisions, Ilkley’s staff were hard at work and it paid off as they not only got their game with Horbury Town under way, but they also claimed a 4-1 win, completing a league double for Town over the Wakefield side. Adi McCormack heads wide for Gildersome against Morley Town. Ilkley manager Simon Armstrong said: “The 4G pitch was covered in snow on Friday but we had bookings over the weekend which creates revenue for the club and a game on Saturday which we wanted to go ahead. “I thought if we got it on it would be one of the few games in the West Yorkshire League which would go ahead and, of course, it is another game out of the way. “Our assistant manager Sam Dexter and general manager Pete Trimnell brushed the pitch three times on Friday to remove the snow and then, by Saturday afternoon, it was in superb condition and we got the game on, and the bonus was we won. Not only did we get another game out of the way, we got three more points. 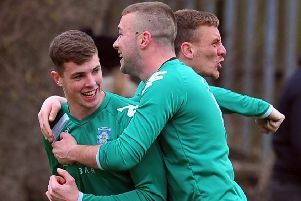 Tom Fleming, Dave Hancock, Harry Brown and top scorer Toby Harris all found the net for Ilkley in a game which Armstrong dubbed a “professional performance”. “We’re absolutely delighted to do the double over Horbury,” he explained. “As a team, we rate them very highly and we anticipate them being in and around the top six. They came into it off the back of a three-match unbeaten run, beating Whitkirk Wanderers and taking a point from Leeds City, so we expected a tough game. Ian Dawson of Gildersome Spurs OB goes past Rob Gumbley of Morley Town. Pictures: Steve Riding. After re-claiming fourth place with the win, Armstrong admitted that his side still haven’t settled on a concrete target position yet. He added: “It’s a difficult one; last season we looked guaranteed fourth at one stage and then we had a really poor run at the end of the season. “We suffered a lot of injuries but Horbury had what you have to call a super run to pip us to fourth by a point, and they thoroughly deserved that position. This season, it could be between us and Hunslet to finish best of the rest. “Whitkirk will be trying to push too, and Field and Horbury have the quality on the day to also have an impact. So, it’s very difficult to say who will finish fourth. Action was sparse elsewhere but seven games survived in the Yorkshire Amateur League sphere with Stanley United finally seeing their fine West Riding FA County Challenge Cup run ended through a heartbreaking 6-5 loss on penalties at Church Fenton after a 1-1 draw. Having decked West Yorkshire League big guns, Leeds City, in the last 16, Stanley took a first-half lead through Dean Powell. But York Minster Engineering League outfit Church Fenton equalised 10 minutes after the break and then held their nerve to win 6-5 on spot kicks after Stanley squandered chances to regain the lead. Stanley have, nonetheless, become one of only five Yorkshire Amateur League teams to have reached the quarter-finals. The other quarter-finalists are Farsley Celtic Juniors, Alwoodley, Ealandians and Leeds Medics & Dentists. Six games survived the elements in the Yorkshire Amateur League with unbeaten Premier Division leaders Farsley Celtic Juniors moving four points clear with a 2-1 triumph at home to third-placed Drighlington. Drighlington took a fifth-minute lead as Shane Sowden netted to become the Premier Division’s leading scorer. But Mark Beal then handled in the area to concede a penalty, netted by spot-kick king Joe Firth. With Beal dismissed, Drig then went down to nine men when Ben Small was sent for an early bath and Drig’s resistance was finally broken with 10 minutes remaining when Alex Reid hammered home the Farsley winner. In the Championship, leaders Gildersome Spurs Old Boys were chinned 3-2 in a top-of-the-table clash at Morley Town, who moved second and level on points. Ryan Hartley bagged a match-winning treble for Morley who claimed all three points despite seeing Kev Mackay sent off. Steve Wales and Matty Jackson struck for Spurs who recovered from being 1-0 down to lead 2-1 before Hartley added two more for his treble. Garforth Crusaders also climbed – to sixth – with a 2-1 success at home to Leeds Independent, Tom Helliwell bagging the winning goal with the last kick of the game. Stephen Phillips had fired Garforth ahead on the hour mark only for Damon Jenkinson to equalise shortly afterwards. In the sole Division One fixture, Thornesians rose to eighth with a 6-3 win at home to fourth-bottom Alwoodley Reserves. James Wootton and Jordan Page both netted braces for Thornesians who also netted through substitute Ethan Cartwright and Jack Willis with a 40-yard screamer. Strikes from Graham Shaw, Steve Dyer and a Tom Allett own goal brought up the Alwoodley tally. In Division Four, leaders Gildersome Spurs Old Boys moved three points clear with a 2-0 win at home to third-bottom Dewsbury Rangers Reserves thanks to goals from Lewis Heeley and Ashley Wainwright. Fourth-bottom North Leeds Reserves also obliged 2-0 at sixth-placed St Bedes Reserves with strikes from Matthew Harding and Alex McGawley.